As the name suggest, this trek will take us to the base of Mt. Gangkar Puensum. This trek starts from Punakha and in mid way it connects to Snowmen trail and ends at Bumthang. The highlight of this trek, Mt. Gangkar Puensum is arguably the world’s highest unclimbed peak. It stands at the height of 7570 m in between Bhutan and China and is ranked 40th tallest mountain in the world and Bhutan’s tallest. Bhutan’s decision to make a complete banned on mountain climbing activities, considering its ideology of preserving natural environment and believing mountains as sacred homes to gods and goddesses who protects the valley beneath has resulted in transforming Mt. Gangkar Puensum into a tallest unclimbed mountain in the world. The name Gangkar Puensum means; three siblings of White Mountain (in Bhutanese language), with reference to its three protruding tops. After reaching at the base of this beautiful mountain, we will spend one extra day camping and hiking to nearby places. 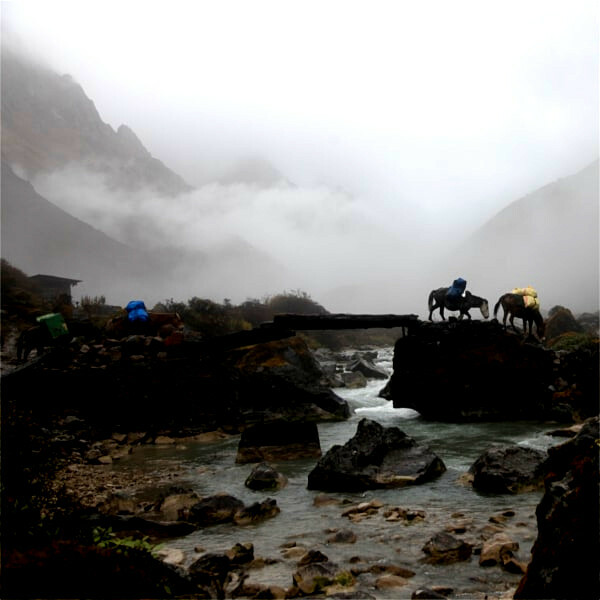 Best Season: Mid-June to October (October is the best recommended month for this trek). Welcome to Bhutan. Your guide and driver will be waiting for you at Paro International airport. The drive from Paro to Thimphu will take around one hour. After reaching Thimphu, check into your hotel, enjoy your lunch and set out for exploring Thimphu city and places around it. Towards evening pay visit to National Memorial Choeten. National Memorial Choeten: Located in the heart of Thimphu city, it was built in 1974 by Her Majesty the Queen Mother Ashi Phuntsho Choden in memory of her son, Third King Jigme Dorji Wangchuck. The three-storey choeten houses several relics such as Phurba Lhatshog, Kagay, Khrowo Nampur Gyalwa, Guru Tshengye, and Khenlop Chesum. The choeten is today the spiritual nerve centre of the city. In the morning visit to Buddha statue located at Kuenselphodrang. From here we will drive towards Punakha via Dochula Pass. After descending down from Dochula pass for about an hour, we will reach Khemae Lhakhang. 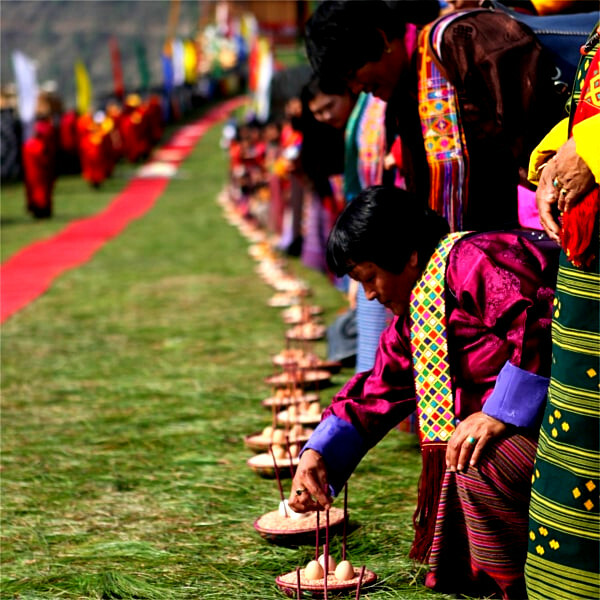 Pay visit to the Lhakhang and head further up towards Punakha. Check into your hotel and towards evening visit Punakha Dzong. 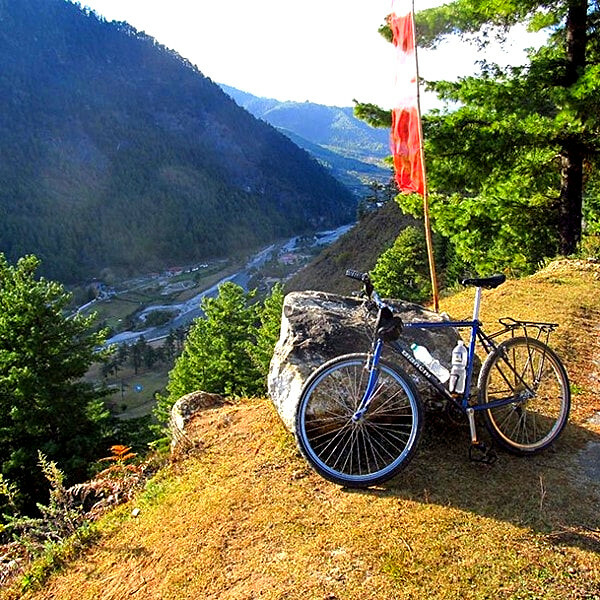 Dochula Pass: Located 23 km east of Thimphu city, Dochula pass at the height of 3100 m above sea level is Bhutan’s most decorated and beautiful pass. On this pass is 108 stupas called Druk Wangyal Chortens, built by Queen mother Ashi Dorji Wangmo Wangchuck. There is also a temple called Druk Wangyal Lhakhang built in the honor of fourth king of Bhutan, Jigme Singye Wangchuck for his service to his subjects. The front yard of this temple is a venue for Druk Wangyal festival which is conducted annually in the month of December. On the backdrop of this pass is the stunning view of snow capped mountain ranges and amongst which is Bhutan’s tallest mountain Mt. Gangkar Puensum(7570m). Khemae Lhakhang: Located on a hillock in Lobesa (Punakha), the temple was built in 1499 by Lam Ngawang Chogyal, the cousin of Lam Drukpa Kunley, on the spot where the latter subdued a demon who was running away in the form of a dog. Lam Drukpa Kunley buried the demon and said there was no dog now (khe – dog; mae – no). Hence, the temple came to be known as the “temple of no dog”. Today however it is pronounced as Chimi Lhakhang. The temple contains the bow and arrows of Lam Drukpa Kunley and a phallus to bless the visitor. Overnight: At hotel in Punakha. Today is the first day of our trekking journey. After an early breakfast from Punakha, drive towards Tashithang from where your trek will begin. Today we will spend one more day here at Laya, acclimatizing and preparing our self for the remaining days. Today we will rest here at Thanza. The yaks that came from Laya will go back from here. New yaks have to be arranged for carrying our stuffs. In mean time you can go around and experience the highland life. Day 16: Halt at Gangkar Puensum base camp. Today we will spend one more day here at Gangkar Puensum base camp, high light of our tour. During the day time we will go for short hikes around enjoying beautiful view of Himalayan mountain ranges including Mt. Gangkar Puensum (7570m). Today is the last day of our trekking tour. From here we will follow Chamkharchhu River till we reach Dur village, where your driver and car will be waiting for you. From here drive towards Chamkhar town and check into your hotel. From Bumthang we will drive towards Gangtey valley. Located at 3000 m above sea level, under Wangdue Phodrang district of western Bhutan, Gangtey valley is a very beautiful, if not the most beautiful glacial valley in Bhutan. It is located at 200 km east of Paro International Airport. During the winter months (November – February), this valley receives its unique visitors, the globally threatened Black Necked Crane(Grus Nigricollis) which migrates from neighboring Tibetan plateaus and Northern India. After breakfast, starts heading towards Paro via Dochula pass. Stop for a while on this pass to enjoy the view. Located 23 km east of Thimphu city, Dochula pass at the height of 3100 m above sea level is Bhutan’s most decorated and beautiful pass. On this pass is 108 stupas called Druk Wangyal Chortens, built by Queen mother Ashi Dorji Wangmo Wangchuck. There is also a temple called Druk Wangyal Lhakhang built in the honour of fourth king of Bhutan, Jigme Singye Wangchuck for his service to his subjects. The front yard of this temple is a venue for Druk Wangyal festival which is conducted annually in the month of December. On the backdrop of this pass is the stunning view of snow capped mountain ranges and amongst which is Bhutan’s tallest mountain Mt. Gangkar Puensum(7570m). After reaching Paro, check into your hotel. After your breakfast, guide and driver will see you off at Paro international airport for your onward destination.